Toy maker Jakks posts disappointing earnings. February 22, 2013 — Toy maker Jakks Pacific reported that net sales for the fourth quarter of 2012..
Google to open its own retail stores this year, report says. February 18, 2013 — It started with Apple stores. Then came Microsoft stores. Are Google stores next? Toy Fair Blog. February 16, 2013 — For the latest updates on Toy Fair, check out our Toy Fair Live Blog. Toy Fair Coverage. February 16, 2013 — Easy way to look through all of TDmonthly's Toy Fair articles, including Toy Fair videos and post-Toy Fair Top-10 lists. Toy Fair Videos. 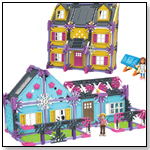 February 16, 2013 — View toy fair videos of hot new products making their debut at the show. Play Yard Sheets Recalled by 4moms Due to Entrapment Hazard. February 6, 2013 — The U.S. Consumer Product Safety Commission (CPSC) in conjunction with 4moms has issued a recall of the following product: About 1,440 4moms® breeze™ Cotton Jersey Playard Sheets by Thorley Industries LLC, d/b/a 4moms, sold at buybuy Baby and other juvenile product stores nationwide and online at www.buybuybaby.com from December 2012 through January 2013 for about $15. Consumers should immediately stop using the product and contact the company for a refund. Million Dollar Baby Dressers Recalled by Bexco Due to Tip-Over Hazards; Two Toddler Deaths Reported. January 31, 2013 — The U.S. Consumer Product Safety Commission (CPSC), in cooperation with Bexco Enterprises Inc., dba Million Dollar Baby of Montebello, Calif. is announcing a voluntary recall of 18,000 children’s four-drawer dressers. 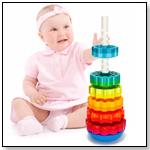 The recalled dressers were sold at JCPenney and independent juvenile specialty stores nationwide and online at Amazon.com, BabiesRUs.com, BabyUniverse.com and other online retailers from January 2006 through June 2010 for between $230 and $300. Consumers should immediately stop using and keep the dresser out of a child’s reach. Consumers can contact Million Dollar Baby to receive a free retrofit kit that contains a wall anchor strap, which attaches to the dresser and wall to help prevent the dresser from tipping. 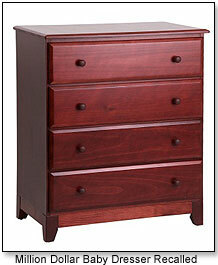 Natart Chelsea Dressers Recalled By Gemme Juvenile To Reduce Tip-Over Hazard; Death of Toddler Reported. January 31, 2013 — The U.S. Consumer Product Safety Commission (CPSC), in cooperation with Gemme Juvenile Inc., of Princeville, Quebec, Canada is announcing a recall to retrofit 300 children's three-drawer dressers. The dressers were sold at Furniture Kidz and other independent juvenile specialty stores and at Baby.com from January 2005 to December 2010 for between $600 and $900. Consumers should immediately stop using and place the dresser out of a child's reach. Free retrofit kits that contain wall anchor straps are being offered to consumers to help prevent the dresser from tipping.